Definitely food for thought (I'm one of the ones bidding on the Hall btw ). I've got a few Farish Halls of the older variety and I'd certainly consider paying for a body to be repainted like that or buying a ready done replacement body for one of them. I've also got various spare body shells of things, as I'm certain other NGFers have. Maybe do a system where you take part payment in body shells ? Good luck with the bid, Zwilnik! It's pleasing to know that you've seen the Hall's development on this thread and know the work that's gone into it! I have got a couple more Hall bodies - older ones from the spam can motor days, but I think they fit the modern chassis too. If you've got any ideas/requests for liveries, let me know and I'll see what I can do...! I have got a couple more Hall bodies - older ones from the spam can motor days, but I think they fit the modern chassis too. I certainly agree that there's a market for bodies only. 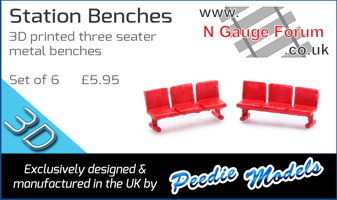 If it's something that will readily fit on an available chassis for us beginners then it's a great way of adding something unique to your loco stud. Yet more good stuff Oz! Is that an Edward Elgar class 50 in the first pic? Er, I think so, Dan...! I don't know much about diesels, so I googled a green livery for a class 50 ('cos I had some green paint!) - I had the "Revenge" nameplate already, so I used that and the 50020 running number. It's a metal kit body on a very solid chassis, so it'll pull like... well, a train, as well! Well it looks good so don't get too caught up in it being prototypically correct. You can hone your skills and then go down the realism route if you want. Whatever takes your fancy. Is it a Farish chassis or something else? A pic of the offending chassis will confirm to me if it's a Farish or not. If it's not, I'm sure others will know what make it is. PS: When you say "smartening up of the glue marks around the nameplates", what does that mean? Do you mean removing of the glue marks (and if so what product would remove the glue but not the paint) or does it mean "blending them in" somehow? Genuinely interested in your methods. Is it a Farish chassis or something else? I have a feeling it's an Atlas chassis - and the body is an old English make - I'll check both tonight and let you know! Dan, where I've glued the plates on I've been a bit over enthusiastic with the CA adhesive and it's seeped out around the sides, making the paint bubble a little. Efforts to scrape it away threatened to ruin my spray job, and I don' t want to have to re-do those decals! This will leave a finely sanded area which (again, in theory) should become invisible once I apply a second coat of satin spray varnish. I didn't really want to do this on top of the plates because it looked fine with one coat, but ho hum! Side point: from now on I'm going to use only Humbrol spray varnish, both acrylic and enamel - other brands I've tried are way too thick and gloopy and drip/run like crazy! When attaching etched plates - tip - place masking tape around the area where the plate is to be located before applying either the plate or adhesive - this will stop the area round the plate being damaged, and can also assist in positioning of the plate. Thanks Alan - lesson learned, I'll do this next time! I have a Class 50 like that which I made back in 1971. It has a body by Anbrico Scale Models of Pudsey (Yorkshire) and was originally mounted on a Bachmann Spectrum GP40 chassis. However, having replaced this a few years ago with a chassis from the Life-Like GE Dash 8-40 it is now a superb runner and very powerful as well as very heavy, just right for hauling my track cleaning wagon around the layout. That's the one - it's an Anbrico kit. I had no idea it was that vintage!! Thanks Mike!